What The Heck Is Going On Here, And How Does This Work? Anyone who travels in Europe has seen those people on the side of the sidewalk trying to get coins from tourists by doing things like posing super-still as statues and so forth. The novelty wears off pretty fast. 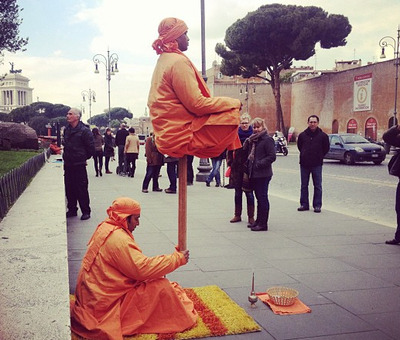 But this combo — seen near the Colosseum in Rome — was actually pretty impressive. Without any break, a guy appears to be sitting on a pole, held up by another guy with his arm straight out. There has to be a trick. On Twitter, someone suggested that there’s a contraption underneath the lower guy’s robe holding it all up.